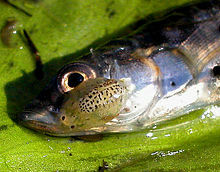 Fish lice are the family Argulidae, or 'carp lice'. They are a group of parasitic crustaceans in the class Maxillopoda. Although they are thought to be primitive forms, they have no fossil record. Argulidae is the only family in the order Arguloida (occasionally "Arguloidea"), although a second family, Dipteropeltidae, has been proposed. ↑ Joel W. Martin & George E. Davis (2001). An updated classification of the Recent Crustacea (PDF). Natural History Museum of Los Angeles County. pp. 132 pp. This page was last changed on 21 May 2014, at 15:28.